The Generalplan Ost (German pronunciation: [ɡenəˈʁaːlˌplaːn ˈɔst]; English: Master Plan for the East), abbreviated as GPO, was the Nazi German government's plan for the genocide and ethnic cleansing on a vast scale, and colonization of Central and Eastern Europe. It was to be undertaken in territories occupied by Germany during World War II. The plan was partially realized during the war, resulting directly and indirectly in the deaths of 9.4 to 11.4 million ethnic Slavs by starvation, disease, ethnic cleansing, mass murder, or extermination through labor, including 4.5 million Soviet citizens, 2.8 to 3.3 million Soviet POWs, 1.8 to 3 million Slavic Poles, 300 to 600 thousand Serbs and 20 to 25 thousand Slovenes. Its full implementation, however, was not considered practicable during the major military operations, and was prevented by Germany's defeat. The plan entailed the enslavement, forced displacement, and mass murder of most Slavic peoples (and substantial parts of the Baltic peoples, especially Lithuanians and Latgalians) in Europe along with planned destruction of their nations, whom the 'Aryan' Nazis viewed as racially inferior. The program operational guidelines were based on the policy of Lebensraum designed by Adolf Hitler and the Nazi Party in fulfilment of the Drang nach Osten (drive to the East) ideology of German expansionism. As such, it was intended to be a part of the New Order in Europe. The master plan was a work in progress. There are four known versions of it, developed as time went on. After the invasion of Poland, the original blueprint for Generalplan Ost (GPO) was discussed by the RKFDV in mid-1940 during the Nazi–Soviet population transfers. The second known version of GPO was procured by the RSHA from Erhard Wetzel in April 1942. The third version was officially dated June 1942. The final settlement master plan for the East came in from the RKFDV on October 29, 1942. However, after the German defeat at Stalingrad planning of the colonization in the East was suspended, and the program was gradually abandoned. The body responsible for the Generalplan Ost was the SS's Reich Main Security Office (RSHA) under Heinrich Himmler, which commissioned the work. The document was revised several times between June 1941 and spring 1942 as the war in the east progressed successfully. It was a strictly confidential proposal whose content was known only to those at the top level of the Nazi hierarchy; it was circulated by RSHA to the Reich Ministry for the Occupied Eastern Territories (Ostministerium) in early 1942. According to testimony of SS-Standartenführer Dr. Hans Ehlich (one of the witnesses before the Subsequent Nuremberg Trials), the original version of the plan was drafted in 1940. As a high official in the RSHA, Ehlich was the man responsible for the drafting of Generalplan Ost along with Dr. Konrad Meyer, Chief of the Planning Office of Himmler's Reich Commission for the Strengthening of Germandom. It had been preceded by the Ostforschung, a number of studies and research projects carried out over several years by various academic centres to provide the necessary facts and figures. The preliminary versions were discussed by Heinrich Himmler and his most trusted colleagues even before the outbreak of war. This was mentioned by SS-Obergruppenführer Erich von dem Bach-Zelewski during his evidence as a prosecution witness in the trial of officials of the Race and Settlement Main Office (RuSHA). According to Bach-Zelewski, Himmler stated openly: "It is a question of existence, thus it will be a racial struggle of pitiless severity, in the course of which 20 to 30 million Slavs and Jews will perish through military actions and crises of food supply." A fundamental change in the plan was introduced on June 24, 1941 – two days after the start of Operation Barbarossa – when the 'solution' to the Jewish question ceased to be part of that particular framework gaining a lethal, autonomous priority. Nearly all the wartime documentation on Generalplan Ost was deliberately destroyed shortly before Germany's defeat in May 1945, and the full proposal has never been found, though several documents refer to it or supplement it. Nonetheless, most of the plan's essential elements have been reconstructed from related memos, abstracts and other documents. A major document which enabled historians to accurately reconstruct the Generalplan Ost was a memorandum released on April 27, 1942, by Erhard Wetzel, director of the NSDAP Office of Racial Policy, entitled "Opinion and thoughts on the master plan for the East of the Reichsführer SS". Wetzel's memorandum was a broad elaboration of the Generalplan Ost proposal. It came to light only in 1957. Adolf Hitler, in his attempt to reassure sceptics, mentioned the world's indifference towards the earlier Armenian Genocide as an argument that possible negative consequences for Germany would be minimal in this case. In subsequent years, his declaration from Berghof has been referred to as Hitler's Armenian quote. Percentages of ethnic groups to be destroyed and/or deported to Siberia by Nazi Germany from future settlement areas. Europe, with pre-war borders, showing the extension of the Generalplan Ost master plan. LEGEND: Dark grey – Germany (Deutsches Reich). Dotted black line – the extension of a detailed plan of the "second phase of settlement" (zweite Siedlungsphase). Light grey – planned territorial scope of the Reichskommissariat administrative units; their names in blue are Ostland (1941-1945), Ukraine (1941-1944), Moskowien (never realized), and Kaukasien (never realized). Generalplan Ost (GPO) (English: Master Plan East) was a secret Nazi German plan for the colonization of Central and Eastern Europe. Implementing it would have necessitated genocide and ethnic cleansing on a vast scale to be undertaken in the European territories occupied by Germany during World War II. It would have included the extermination of most Slavic people in Europe. The plan, prepared in the years 1939-1942, was part of Adolf Hitler's and the Nazi movement's Lebensraum policy and a fulfilment of the Drang nach Osten (English: Drive towards the East) ideology of German expansion to the east, both of them part of the larger plan to establish the New Order. The final version of the Generalplan Ost proposal was divided into two parts; the "Small Plan" (Kleine Planung), which covered actions carried out in the course of the war; and the "Big Plan" (Grosse Planung), which described steps to be taken gradually over a period of 25 to 30 years after the war was won. Both plans entailed the policy of ethnic cleansing. As of June 1941, the policy envisaged the deportation of 31 million Slavs to Siberia. The Generalplan Ost proposal offered various percentages of the conquered or colonized people who were targeted for removal and physical destruction; the net effect of which would be to ensure that the conquered territories would become German. In ten years' time, the plan effectively called for the extermination, expulsion, Germanization or enslavement of most or all East and West Slavs living behind the front lines of East-Central Europe. The "Small Plan" was to be put into practice as the Germans conquered the areas to the east of their pre-war borders. In this way the plan for Poland was drawn up at the end of November 1939 and is probably responsible for much of the World War II expulsion of Poles by Germany (first to colonial district of the General Government and, from 1942 also to Polenlager). 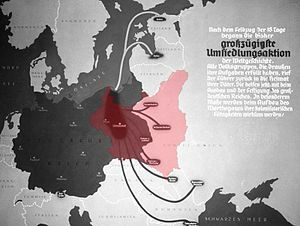 After the war, under the "Big Plan", Generalplan Ost foresaw the removal of 45 million non-Germanizable people from Central and Eastern Europe, of whom 31 million were "racially undesirable", 100% of Jews, Poles (85%), Lithuanians (85%) , Belorussians (75%) and Ukrainians (65%), to West Siberia, and about 14 million were to remain, but were to be treated as slaves. In their place, up to 8-10 million Germans would be settled in an extended "living space" (Lebensraum). Because the number of Germans appeared to be insufficient to populate the vast territories of Central and Eastern Europe, the peoples judged to lie racially between the Germans and the Russians (Mittelschicht), namely, Latvians and even Czechs, were also supposed to be resettled there. 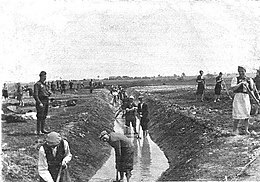 Prisoners of the Krychów forced labor camp dig irrigation ditches for the new German latifundia of the General Plan East in 1940. Most of them, Polish Jews and some Roma people, were sent to Sobibór extermination camp afterwards. According to Nazi intentions, attempts at Germanization were to be undertaken only in the case of those foreign nationals in Central and Eastern Europe who could be considered a desirable element for the future Reich from the point of view of its racial theories. The Plan stipulated that there were to be different methods of treating particular nations and even particular groups within them. Attempts were even made to establish the basic criteria to be used in determining whether a given group lent itself to Germanization. These criteria were to be applied more liberally in the case of nations whose racial material (rassische Substanz) and level of cultural development made them more suitable than others for Germanization. The Plan considered that there were a large number of such elements among the Baltic nations. Erhard Wetzel felt that thought should be given to a possible Germanization of the whole of the Estonian nation and a sizable proportion of the Latvians. On the other hand, the Lithuanians seemed less desirable since "they contained too great an admixture of Slav blood." Himmler's view was that "almost the whole of the Lithuanian nation would have to be deported to the East". Himmler is described to even have had a positive attitude towards germanizing the populations of Alsace-Lorraine, border areas of Slovenia (Upper Carniola and Southern Styria) and Bohemia-Moravia, but not Lithuania, claiming its population to be of "inferior race". Lithuania, Latvia and Estonia were to be deprived of their statehood, while their territories were to be included in the area of German settlement. This meant that Latvia and especially Lithuania would be covered by the deportation plans, though in a somewhat milder form than the expulsion of Slavs to western Siberia. While the Baltic nations like Estonians would be spared from repressions and physical liquidation (that the Jews and the Poles were experiencing), in the long term the Nazi planners did not foresee their existence as independent entitites and they would be deported as well, with eventual denationalisation; initial designs were for Latvia, Lithuania and Estonia to be Germanized within 25 years, however Heinrich Himmler revised them to 20 years. Nazi propaganda poster of the Third Reich in 1939 (dark grey) after the conquest of Poland. It depicts pockets of German colonists resettling into Polish areas annexed by Nazi Germany from Soviet controlled territories during the "Heim ins Reich" action. The outline of Poland (here superimposed in red) was missing from the original poster. In 1941 it was decided to destroy the Polish nation completely and the German leadership decided that in 15–20 years the Polish state under German occupation was to be fully cleared of any ethnic Poles and settled by German colonists. :32 A majority of them, now deprived of their leaders and most of their intelligentsia (through mass murder, destruction of culture, the ban on education above the absolutely basic level, and kidnapping of children for Germanization), would have to be deported to regions in the East and scattered over as wide an area of Western Siberia as possible. According to the plan this would result in their assimilation by the local populations, which would cause the Poles to vanish as a nation. According to plan, by 1952 only about 3–4 million 'non-Germanized' Poles (all of them peasants) were to be left residing in the former Poland. Those of them who would still not Germanize were to be forbidden to marry, the existing ban on any medical help to Poles in Germany would be extended, and eventually Poles would cease to exist. Experiments in mass sterilization in concentration camps may also have been intended for use on the populations. The Wehrbauer, or soldier-peasants, would be settled in a fortified line to prevent civilization reanimating beyond the Ural Mountains and threatening Germany. "Tough peasant races" would serve as a bulwark against attack — however, it was not very far east of the "frontier" that the westernmost reaches within continental Asia of the Third Reich's major Axis partner, Imperial Japan's own Greater East Asia Co-Prosperity Sphere would have existed, had a complete defeat of the Soviet Union occurred. Widely varying policies were envisioned by the creators of Generalplan Ost, and some of them were actually implemented by Germany in regards to the different Slavic territories and ethnic groups. For example, by August–September 1939 (Operation Tannenberg followed by the A-B Aktion in 1940), Einsatzgruppen death squads and concentration camps had been employed to deal with the Polish elite, while the small number of Czech intelligentsia were allowed to emigrate overseas. Parts of Poland were annexed by Germany early in the war (leaving aside the rump German-controlled General Government and the areas previously annexed by the Soviet Union), while the other territories were officially occupied by or allied to Germany (for example, the Slovak part of Czechoslovakia became a theoretically independent puppet state, while the ethnic-Czech parts of the Czech lands (so excluding the Sudetenland) became a "protectorate"). It is unknown to what degree the plan was actually directly connected to the various German war crimes and crimes against humanity in the East, especially in the latter phases of the war. In any case, the majority of Germany's 12 million forced laborers were abducted from Eastern Europe, mostly in the Soviet territories and Poland (both Slavs and local Jews). The Soviet Extraordinary State Commission formed in World War II in order to investigate the Nazi crimes, which was tasked also with compensating the state for damages suffered by the USSR, reported 8.2 million Soviet civilian war dead, (4.0 million in Ukraine; 2.5 million in Belarus; and 1.7 million in Russia) as the result of German occupation. These figures have been disputed outside of Russia. Some reports prepared by the Commission are now considered outright fabrications, such as the shifting of blame for the Katyn massacre perpetrated by the Soviet authorities themselves. The losses were for the entire territory of the USSR in 1946 to 1991 borders, including territories occupied by the Red Army in 1939–1940. The commission reported figures of 2.4 million civilian losses in annexed lands included citizens of prewar Poland along with inhabitants of other states  occupied by the Soviet Union. The overall statistics included Russian victims of Stalinist terror as well. The Russian Academy of Sciences in 1995 estimated that the World War II casualties of the Soviet Union included 13.7 million civilian dead, 20% of the 68 million persons in the occupied USSR.This included 7.4 million victims of Nazi policies and reprisals; 2.2 million deaths of persons deported to Germany for forced labor; and 4.1 million famine and disease deaths in occupied territory. To support these figures, they cited sources published in the Soviet era based on the work of the Extraordinary State Commission, there were an additional estimated 3 million famine deaths in areas of the USSR not under German occupation. These figures are cited in the official publications of the Russian government  This was disputed by the Russian historian Viktor Zemskov who maintained that the government's estimate for the civilian war dead is overstated because it includes about 7 million deaths resulting from natural causes, based on the mortality rate that prevailed before the war, and that reported civilian deaths in the occupied regions included persons who were evacuated to the rear areas. He submitted an estimate of 4.5 million civilians who were Nazi victims or were killed in the occupied zone and 4 million deaths due to the deterioration in living conditions. Timothy D. Snyder maintains that there were 4.2 million victims of the German Hunger Plan in the Soviet Union, "largely Russians, Belarusians and Ukrainians," including 3.1 million Soviet POWs and 1.0 million civilian deaths in the Siege of Leningrad. According to Snyder, Hitler intended eventually to exterminate up to 45 million Poles, Ukrainians, Belarusians and Czechs by planned famine as part of Generalplan Ost. Wannsee Conference about the "Final Solution"
^ Niewyk, Donald L.; Nicosia, Francis R. (2012-07-24). The Columbia Guide to the Holocaust. Columbia University Press. ISBN 9780231528788. ^ Berenbaum, Michael; Kramer, Arnold; Museum, United States Holocaust Memorial (2005-12-09). The world must know: the history of the Holocaust as told in the United States Holocaust Memorial Museum. United States Holocaust Memorial Museum. ISBN 9780801883583. ^ "Polish Resistance and Conclusions — United States Holocaust Memorial Museum". www.ushmm.org. Retrieved 2018-12-31. Documentation remains fragmentary, but today scholars of independent Poland believe that 1.8 to 1.9 million Polish civilians (non-Jews) were victims of German Occupation policies and the war. This approximate total includes Poles killed in executions or who died in prisons, forced labor, and concentration camps. It also includes an estimated 225,000 civilian victims of the 1944 Warsaw uprising, more than 50,000 civilians who died during the 1939 invasion and siege of Warsaw, and a relatively small but unknown number of civilians killed during the Allies' military campaign of 1944—45 to liberate Poland. ^ "Project InPosterum: Poland WWII Casualties". www.projectinposterum.org. Retrieved 2018-12-31. ^ Łuczak, Czesław. "Szanse i trudności bilansu demograficznego Polski w latach 1939–1945", Dzieje Najnowsze, issue 1994/2. ^ Glišić, Venceslav (12 January 2006). "Žrtve licitiranja - Sahrana jednog mita, Bogoljub Kočović". NIN (in Serbian). Archived from the original on 1 August 2013. Retrieved 8 May 2012. ^ Dietrich Eichholtz»Generalplan Ost« zur Versklavung osteuropäischer Völker. PDF file, direct download. ^ a b c d e f g Misiunas, Romuald J.; Taagepera, Rein (1993). The Baltic States: Years of Dependence, 1940-80. University of California Press. pp. 48–9. ISBN 978-052008228-1. ^ Stephenson, Jill (2006). Hitler's Home Front: Wurttemberg Under the Nazis. Hambledon Continuum. p. 113. ISBN 978-1-85285-442-3. Other non-'Aryans' included Slavs, Blacks and Roma and Sinti (Romanies), although some of these last were classed as 'racially pure'. ^ "Lebensraum". encyclopedia.ushmm.org. Retrieved 2019-03-05. ^ "Generalplan Ost (General Plan East). The Nazi evolution in German foreign policy. Documentary sources". World Future Fund. ^ a b Schmuhl, Hans-Walter (2008). The Kaiser Wilhelm Institute for Anthropology, Human Heredity, and Eugenics, 1927–1945. Crossing boundaries. Boston Studies in the Philosophy and History of Science. 259. Springer Netherlands. pp. 348–9. ISBN 978-90-481-7678-6. ^ Poprzeczny, Joseph (2004). Odilo Globocnik, Hitler's Man in the East. McFarland. p. 186. ISBN 978-0-7864-1625-7. ^ a b c d Gellately, Robert (1996). "Reviewed Works: Vom Generalplan Ost zum Generalsiedlungsplan by Czeslaw Madajczyk; Der 'Generalplan Ost'. Hauptlinien der nationalsozialistischen Planungs- und Vernichtungspolitik by Mechtild Rössler, Sabine Schleiermacher". Central European History. 29 (2): 270–274. doi:10.1017/S0008938900013170. JSTOR 4546609. References: Madajczyk (1994); Rössler & Scheiermacher (1993). ^ Weiss-Wendt, Anton (2010). Eradicating Differences: The Treatment of Minorities in Nazi-Dominated Europe. Cambridge Scholars Publishing. p. 69. ISBN 978-1443824491. ^ Streeter, Stephen M.; Weaver, John C.; Coleman, William D. (2009). Empires and Autonomy: Moments in the History of Globalization. UBC Press. p. 181. ISBN 978-077481600-7. ^ Churchill, Ward (1997). A little matter of genocide: holocaust and denial in the Americas, 1492 to the present. San Francisco: City Lights Books. p. 52. ISBN 978-087286323-1. ^ a b Eichholtz, Dietrich (September 2004). ""Generalplan Ost" zur Versklavung osteuropäischer Völker" [Generalplan Ost for the enslavment of East European peoples] (downloadable PDF). Utopie Kreativ (in German). 167: 800–8 – via Rosa Luxemburg Stiftung. ^ a b c d e f g h Gumkowski, Janusz; Leszczynski, Kazimierz (1961). Poland under Nazi Occupation. Warsaw: Polonia Publishing House. OCLC 456349. See excerpts in "Hitler's Plans for Eastern Europe". Holocaust Awareness Committee - History Department, Northeastern University. Archived from the original on 2011-11-25. ^ Pinfield, Nick (2015). Fordham, Michael; Smith,David (eds.). Democracy and Nazism: Germany, 1918-1945. Student Book. p. 173. ISBN 978-110757316-1. ^ Smith, David J. (2001). Estonia: Independence and European Integration. Routledge. p. 35. ISBN 978-041526728-1. ^ "Wissenschaft, Planung, Vertreibung - Der Generalplan Ost der Nationalsozialisten". Eine Ausstellung der Deutschen Forschungsgemeinschaft (DFG) (in German). 2006. ^ Madajczyk, Czesław (1980). "Die Besatzungssysteme der Achsenmächte. Versuch einer komparatistischen Analyse" [Occupation modalities of the Axis powers. A possible comparative analysis]. Studia Historiae Oeconomicae. 14: 105–22. See also Müller, Rolf-Dieter; Ueberschär, Gerd R., eds. (2008). Hitler's War in the East, 1941-1945: A Critical Assessment. Berghahn. ISBN 978-1-84545-501-9. Google Books. ^ Tomaszewski, Irene; Werbowski, Tecia (2010). Code Name Żegota: Rescuing Jews in Occupied Poland, 1942–1945. ABC-CLIO. p. 10. ISBN 978-0-313-38391-5. Retrieved May 11, 2012. ^ a b Connelly, J. (1999). "Nazis and Slavs: From Racial Theory to Racist Practice". Central European History. 32 (1): 1–33. doi:10.1017/S0008938900020628. JSTOR 4546842. PMID 20077627. ^ "Obozy pracy na terenie Gminy Hańsk" [Labor camps in Gmina Hańsk] (in Polish). hansk.info. Retrieved 29 September 2014. ^ Heinemann, Isabel (1999). Rasse, Siedlung, deutsches Blut. Das Rasse- und Siedlungshauptamt der SS und die rassenpolitische Neuordnung Europas. Wallstein Verlag. p. 370. ISBN 978-3892446231. ^ Raun,Toivo U. (2002). Estonia and the Estonians (2nd updated ed.). Stanford CA: Hoover Institution Press. pp. 160–4. ISBN 978-0817928537. ^ Nicholas, Lynn H. (2011). Cruel World: The Children of Europe in the Nazi Web. Knopf Doubleday. p. 194. ISBN 978-0307793829. ^ Berghahn, Volker R. (1999). "Germans and Poles 1871–1945". In Bullivant, K.; Giles,G.J. ; Pape, W. (eds.). Germany and Eastern Europe: Cultural Identities and Cultural Differences. Rodopi. pp. 15–34. ISBN 978-9042006881. ^ Weinberg, Gerhard L. (2005). Visions of Victory: The Hopes of Eight World War II Leaders. Cambridge Univ. Press. p. 24. ISBN 978-052185254-8. ^ Cecil, Robert (1972). The Myth of the Master Race: Alfred Rosenberg and Nazi Ideology. New York City: Dodd, Mead & Co. p. 19. ISBN 978-0-396-06577-7. ^ Sontheimer, Michael (27 May 2011). "When We Finish, Nobody Is Left Alive". Spiegel Online. ^ Berkhoff (2004), p. 45. ^ Berkhoff (2004), p. 166. ^ Korbonski, Stefan (1981). The Polish Underground State: A Guide to the Underground, 1939-1945. Hippocrene Books. pp. 120, 137–8. ISBN 978-088254517-2. ^ Akinsha, Konstantin; Kozlov, Grigorii (2007). "April 1991 Spoils of War: The Soviet Union's Hidden Art Treasures". ArtNews. ^ Kumanev, Georgily A. The German occupation regime on occupied territory in the USSR. In Berenbaum (1990), p. 140. ^ Fischer, Benjamin B. (2008). "The Katyn Controversy: Stalin's Killing Field". CIA. Retrieved 10 December 2005. ^ Cienciala, Anna M.; Materski, Wojciech (2007). Katyn: a crime without punishment. Yale University Press. pp. 226–9. ISBN 978-0-300-10851-4. ^ Жертвы двух диктатур. Остарбайтеры и военнопленные в Третьем Рейхе и их репатриация. – М.: Ваш выбор ЦИРЗ, 1996, pp. 735-8. [Victims of Two Dictatorships. Ostarbeiters and POW in Third Reich and Their Repatriation] (in Russian). Quote: "2,411,430 in annexed territories including (1,538,544 from Poland: Stanislav 223,920; Volyn 65,440; Lviv/Lwow 475,435; Rovno 175,133; Ternopol 172,357; Lutsk 117,549; Brest 159,526, Horodna 111,203; and Polesskya 37,981) Lithuania: including Vilnius/Wilno 436,535; Latvia: 313,798; Estonia: 61,307; and Moldova: 61,246.". ^ Жертвы двух диктатур. Остарбайтеры и военнопленные в Третьем Рейхе и их репатриация. – М.: Ваш выбор ЦИРЗ, 1996, pp. 735-8. [Victims of Two Dictatorships. Ostarbeiters and POW in Third Reich and Their Repatriation] (in Russian). Quote: "2,411,430 in annexed territories including (1,538,544 from Poland: Stanislav 223,920; Volyn 65,440; Lviv/Lwow 475,435; Rovno 175,133; Ternopol 172,357; Lutsk 117,549; Brest 159,526, Horodna 111,203; and Polesskya 37,981) Lithuania: including Vilnius/Wilno 436,535; Latvia: 313,798; Estonia: 61,307; and Moldova: 61,246." ^ Davies, Norman (2012). Boże igrzysko [God's Playground]. 2 (Polish ed.). Otwarte. p. 956. ISBN 978-8324015566. To, co robili Sowieci, było szczególnie mylące. Same liczby były całkowicie wiarygodne, ale pozbawione komentarza, sprytnie ukrywały fakt, że ofiary w przeważającej liczbie nie były Rosjanami, że owe miliony obejmowały ofiary nie tylko Hitlera, ale i Stalina, oraz że wśród ludności cywilnej największe grupy stanowili Ukraińcy, Polacy, Białorusini i Żydzi. Translation: The Soviet methods were particularly misleading. The numbers were correct, but the victims were overwhelmingly not Russian, and came from either one of the two regimes. ^ Wegner, Bernd (1997). From peace to war: Germany, Soviet Russia, and the world, 1939–1941. Berghahn. p. 74. ISBN 978-1-57181-882-9. ^ Daniel Goldhagen, Hitler's Willing Executioners (p. 290) — "2.8 million young, healthy Soviet POWs" killed by the Germans, "mainly by starvation ... in less than eight months" of 1941–42, before "the decimation of Soviet POWs ... was stopped" and the Germans "began to use them as laborers". ^ Zemskov, Viktor N. (2012). "О масштабах людских потерь CCCР в Великой Отечественной Войне" [The extent of human losses USSR in the Great Patriotic War]. Military Historical Archive (Военно-исторический архив) (in Russian). 9: 59–71 – via Demoskop Weehly vol. 559-560 (2013). ^ Snyder (2010), Bloodlands,p. 411. Snyder states "4.2 million Soviet citizens starved by the German occupiers"
Aly, Götz; Heim, Susanne (2003). Architects of Annihilation: Auschwitz and the Logic of Destruction. Phoenix. The General Plan for the East. ISBN 978-1-84212-670-7 – via Google Books. Berenbaum, Michael, ed. (1990). A Mosaic of Victims: Non-Jews Persecuted and Murdered by the Nazis. NYUP. ISBN 978-1-85043-251-7. Berkhoff, Karel C. (2004). Harvest of Despair: Life and Death in Ukraine Under Nazi Rule. Belknap Press. ISBN 978-0-674-01313-1. Browning, Christopher R. (2007). The Origins of the Final Solution: The Evolution of Nazi Jewish Policy, September 1939-March 1942. U of Nebraska Press. Generalplan Ost: The Search for a Final Solution through Expulsion. ISBN 978-0803203921. Fritz, Stephen G. (2011). Ostkrieg: Hitler's War of Extermination in the East. University Press of Kentucky. Generalplan Ost (General plan for the east). ISBN 978-0813140506 – via Google Books. Koehl, Robert L. (1957). Rkfdv: German Resettlement and Population Policy 1939-1945. : A History of the Reich Commission for the Strengthening of Germandom. Harvard University Press. OCLC 906064851. Madajczyk, Czesław (1962). "General Plan East. Hitler's Master Plan for expansion". Polish Western Affairs. III (2). Resources: Wetzel (1942); Meyer-Hetling (1942). Note: After World War II, it was thought, that the memorandum itself had been lost. The first information of its content was given in Koehl (1957), p. 72. Madajczyk, Czesław, ed. (1994). Vom Generalplan Ost Zum Generalsiedlungsplan: Dokumente (in German). De Gruyter. ISBN 978-3598232244. Rössler, Mechtild; Scheiermacher, Sabine, eds. (1993). Der 'Generalplan Ost' Hauptlinien der nationalsozialistischen Plaungs-und Vernichtungspolitik (in German). Akademie-Verlag. ISBN 978-3050024455. Russian Academy of Science (1995). Liudskie poteri SSSR v period vtoroi mirovoi voiny:sbornik statei [Human losses of the USSR in the period of WWII: collection of articles.] (in Russian). Sankt-Petersburg. ISBN 978-5-86789-023-0. Snyder, Timothy (2012). Bloodlands: Europe Between Hitler and Stalin. Basic Books. Generalplan Ost. ISBN 978-0465002399. Wildt, Michael (2008). Generation of the unbound: the leadership corps of the Reich Security Main Office. Wallstein Verlag. Weltanschauung. ISBN 978-3835302907 – via Google Books. Meyer-Hetling, Konrad (June 1942). 'Generalplan Ost', Rechtliche, wirtschaftliche und räumliche Grundlagen des Ostaufbaues (in German). Under supervision of Heinrich Himmler. Wetzel, Erhard (27 April 1942). Stellungnahme und Gedanken zum Generalplan Ost des Reichsführers S.S. [Opinion and thoughts on the master plan for the East of the Reichsführer SS] (Memorandum). pp. 297–324. In "Dokumentation - Der Generalplan Ost" (PDF). Vierteljahrshefte für Zeitgeschichte. 6 (3): 281–325. 1958. Kamenetsky, Ihor (1961). Secret Nazi Plans for Eastern Europe: A Study of Lebensraum Policies. New York City: Bookman Associates. Wildt, Michael. "The Spirit of the Reich Security Main Office (RSHA)." Totalitarian Movements and Political Religions (2005) 6#3 pp. 333–349. Full article available with purchase. Deutsches Historisches Museum (2009), Berlin, Übersichtskarte: Planungsszenarien zur "völkischen Flurbereinigung" in Osteuropa.